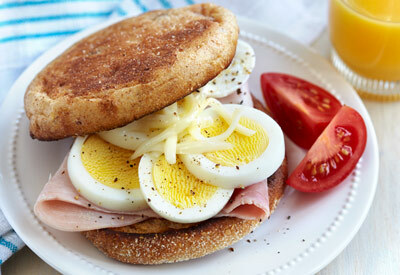 Add Italian cheese and Dijon mustard for a microwave hard-boiled egg breakfast (or lunch) sandwich. Add seasonal veggies for extra crunch. ARRANGE ham slice onto muffin bottom. TOP with egg slices; season with salt and pepper, if desired. SPRINKLE with cheese. MICROWAVE on HIGH 30 seconds until warm and cheese melts. Cover with muffin Top. SERVE with tomato and spread, if desired. Microwave ovens vary. Cook time may need to be adjusted. Hard-cooked eggs are easiest to peel right after cooling. Cooling causes the egg to contract slightly in the shell. To peel a hard-cooked egg: Gently tap egg on countertop until shell is finely crackled all over. Roll egg between hands to loosen shell. Starting peeling at large end, holding egg under cold running water to help ease the shell off. Hard-cooked egg storage time: In the shell, hard-cooked eggs can be refrigerated safely up to one week. Refrigerate in their original carton to prevent odor absorption. Once peeled, eggs should be eaten that day.